Everyone knows that sitting at your desk for long stretches of time can wreak all kinds of havoc with your health. But treadmill desks are expensive and jogging with a laptop doesn’t work so well, so what’s the health-conscious worker to do? 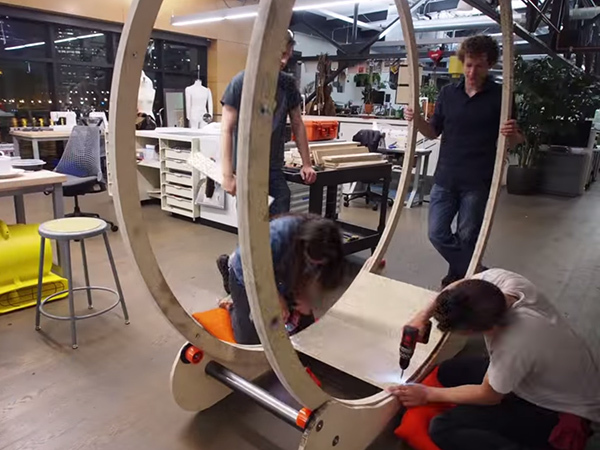 How about joining the rat race with a human hamster wheel. With just a little bit of plywood, some skate wheels and some glue, you can build your own healthy standing desk thanks to Robb Godshaw’s brilliant DIY instructions. According to Godshaw, office workers are being held back from their potential by the office standards of yore. “Numerous esteemed experts agree that standing is better than sitting and that walking is better than standing. Despite this, your workplace only provides inhumane chairs and stagnant standing desks for you to use while you struggle to get through a workday full of distractions and bodily pains,” says Godshaw. Godshaw created the wheel design along with Instructables Developer Will Doenlen and set up the whole contraption in under 24-hours. Godshaw says that he considered adding brakes to the wheel, but decided against it, “in order to really force the productivity out of the desk user.” We say, if you are going to be a part of the rat race, might as well embrace it, right? Everyone knows that sitting at your desk for long stretches of time can wreak all kinds of havoc with your health. But treadmill desks are expensive and jogging with a laptop doesn't work so well, so what’s the health-conscious worker to do? 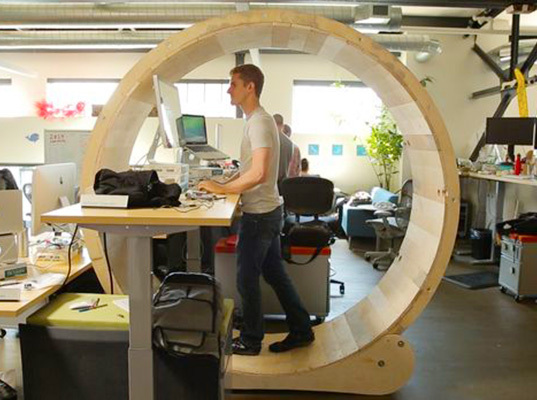 How about joining the rat race with a human hamster wheel. 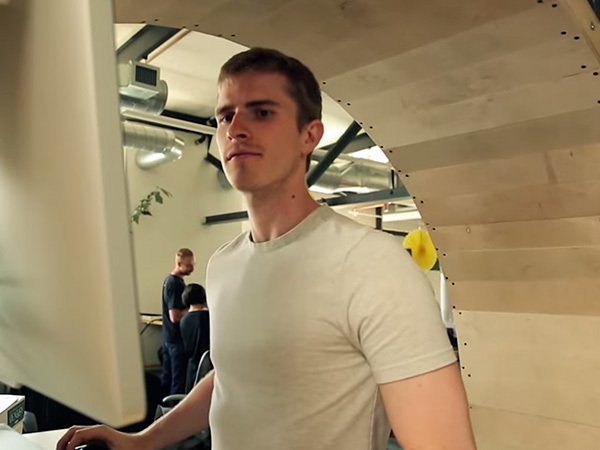 With just a little bit of plywood, some skate wheels and some glue, you can build your own healthy standing desk thanks to Robb Godshaw’s brilliant DIY instructions.